Roush Industries in Livonia, Mich., is known for its engineering services work in the automotive, oil and gas, recreational and aerospace industries; however, most people associate the company with its reputation for auto racing. It is part of the winning Roush Fenway Racing team in the Nationwide and Sprint Cup Series as well as all Ford Racing NASCAR teams. Because of the specialty nature of Roush’s work, production volumes can vary from one-off parts to creating hundreds of parts, in either single-run or repeat jobs. With customers increasingly under pressure for shorter lead-times, Roush Industries often finds itself needing to switch the jobs it is machining within a matter of minutes in order to meet demand. The company wanted to maintain a very flexible production environment that would enable it to immediately accommodate these situations and to adapt to changing part orders coming from both internal and external sources. 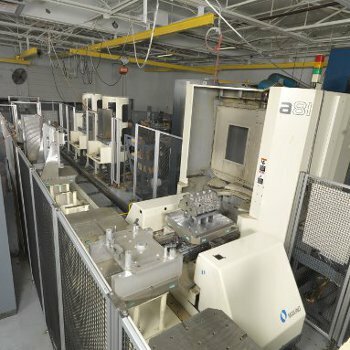 Roush Industries already had three Makino a81 horizontal machining centers that it immediately put to work to meet its production goal. These machines are part of a 20-pallet Makino Machining Complex (MMC) automated material-handling system and the company set out to maximize use of that automated cell and its MAS-A5 control. A fourth a81 stand-alone machine runs adjacent to the cell to add workflow flexibility. Roush upgraded its tool capacity from 99 tools to 137 to enable the automated cell to run unattended longer. Later, due to the efficiency of the first stand-alone and additional business, a second stand-alone a81 machine was purchased to handle extra jobs. The cell’s MAS-A5 gives the company much flexibility when more than one machine is needed on a part that requires multiple operations. The automated cell has led to the reliable production of high-performance aluminum cylinder heads—a job that would not have been profitable to take on without automation because of its low volumes. In addition, Roush has been able to meet critical tolerances for the FR9 Ford Racing block on the a81 machines, yielding repeatable results. At Roush, jobs can be turned around in as quickly as one day, depending on the complexity of the part, material availability and the machine workload. Tolerances of 0.0005 inches are easily being held in all jobs. The stand-alone a81 machines are used in conjunction with the cell. They add flexibility when there are situations where new orders could disrupt the production within the cell. These stand-alone machines handle excess capacity and jobs not suited for automation while helping Roush use all of its tooling capabilities.